Doras Buí is a community resource centre for one parent families located on the north east side of Dublin City, Ireland. We are a non-profit charitable organisation. Doras Buí, a parents alone resource centre, was founded in 1986 as part of the EU Second Programme to Combat Poverty. Formerly known as P.A.R.C (the Parents Alone Resource Centre), since 1990, all our activities are supported and funded through a combination of grants from Government Departments and statutory bodies, charitable foundations and donations from individuals.We were the first locally-based resource centre for lone parents and their children in Ireland and we have grown from a modest base in two maisonettes provided by Dublin City Council to a purpose built centre which was opened in 1992 by the then President of Ireland, Mary Robinson who became our patron in 2002. In 1998, the centre was extended for the construction of a full time Early Years which provides 89 childcare places. We are implementing the High/Scope Early Years Curriculum, an approach to early learning developed in the US in the 1960s specifically for children living in situations of poverty and disadvantage. High/Scope fosters the characteristics of independence, problem solving and communication abilities which, together can be described as life skills. This approach mirrors the model of work we have developed for working with lone parents. “Doras Buí is a community development Resource Centre & Early Year’s Service that provides high quality supports and programmes to one parent families living in the North-East Dublin area. We are committed to the delivery of an excellent early year’s services in a safe and inclusive environment where children and families are facilitated to reach their full potential”. We aim to support lone parents to extend their life choices, overcome discrimination and isolation and become socially and economically independent. To bring lone parents together in the catchment area of the organisation and support them to jointly identifying their own needs & tackling their own problems. To highlight policy needs and issues of lone parents families to policymakers and local statutory agencies. To promote the development, co-ordination and integration of services and facilities for lone parent families & children, irrespective of status. To collaborate with local community and statutory partners in the development, co-ordination and integrating of services and facilities for lone parents families. To promote rights based approaches to the provision of services to lone parent families. To collaborate with local community and statutory partners to improve health and well-being of the community as a whole. To provide an inclusive high quality, affordable childcare to all families. 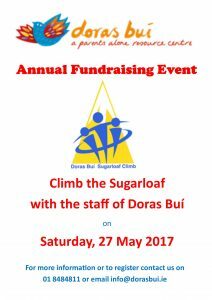 Doras Buí prides itself in knowing that all activities provided come from the needs of our client group. Regular consultation meetings take place and are delivered in a spirit of solidarity and professionalism. Our organisational philosophy aims to encourage social and economic self-reliance, confidence and the development of skills. We keep ourselves fully informed about factors and trends affecting lone parent families at local, regional and national levels. We are continuously engaged in policy initiatives in relation to issues affecting lone parent lives. We work in partnership with community and local development organisations and state agencies in the interests of lone parent families and for the benefit of all families living in our catchment area. We are committed to ensuring that our policies, activities and services do not discriminate against any person on grounds of gender, marital status, family status, sexual orientation, religious belief, age, disability, race or membership of the travelling community. Lone parents are encouraged to contact the centre directly either by dropping in or by phone and referrals are welcomed from GPs other health service professionals and local community organisations and groups. Good governance is a key issue for Doras Bui. Almost all our Board of Management members and staff are local people who are either currently parenting alone or may have lived in a one-parent family. This experience is invaluable in ensuring that the services we provide continue to be delivered in a respectful, confidential and professional manner.We work closely with other local community groups and statutory agencies to build a strong and vibrant community where people of all ages feel safe and secure and enjoy a good quality of life.